It is thought Zambezi means ‘Great River’ in the language of the Tonga people who inhabit its middle reaches. However the Lozi refer to the river as 'yambezhi' (pronounced 'le-am-by'), meaning 'heart of all', but it is possible the name has common ancestory in both languages. For many years the river was spelt 'Zambesi', with the now popular spelling of 'Zambezi' becoming only widely used in the latter half of the last century. The Zambezi River is the forth longest river in Africa (after the Nile, Congo, and Niger) and the largest to discharge into the Indian Ocean from the African continent, flowing for about 2,574 kilometres from its source on the Central African Plateau to sea. Rising in Zambia at a height of 1,524 metres above sea level, the Zambezi flows through, or borders, six countries (Zambia, Angola, Namibia, Botswana, Zimbabwe and Mozambique) before discharging into the Indian Ocean. The Zambezi River basin catchment area extends over the territory of eight countries - Zambia, Angola, Namibia, Botswana, Zimbabwe, Malawi, Tanzania and Mozambique - a catchment area of 1,320,000 km2 with a cumulative mean annual flow of approximately 97 km3 - making it the largest river in southern Africa. By comparison the Zambezi roughly equates to the Nile, but is significantly less than the annual flow of the Congo, which in turn is significantly less than that of the Amazon. The river is generally separated into three sub-sections, representing its different physical and biological characteristics. The coastal section, or Lower Zambezi, stretches 360 miles up as far as the Cahora Bassa gorge, now flooded by the Cahora Bassa Dam. The Middle Zambezi is 600 miles long, in low-lying country, and is divided from the Upper Zambezi regions of the river by the Victoria Falls, 1,000 miles from the coast. The wider Zambezi River Basin is home to some forty million people who speak Bantu-lineage local languages with English and Portuguese being the main official languages. The Basin is well endowed with mineral, water and energy resources, natural tourist attractions like the Victoria Falls, as well as a healthy wildlife population. The Zambezi has a number of important tributaries, which constitute major rivers in their own right, including the Shire River, flowing from the territories of Tanzania, Malawi and Mozambique, the Luangwa, Kafu and Kabompo rivers, lying wholly within Zambia, the Luena, from the territory of Angola and Zambia, and the Cuando (or Kwando), also known as the Chobe, draining from Angola, Namibia and Botswana. The most westerly of these is the Cuando (or Kwando), draining an area from Angola, Namibia and Botswana. Following a south-easterly course as far as the Botswana–Namibia border, it veers sharply northeastwards to link with the Zambezi via the Linyanti-Chobe floodplain. The mid-section of the Cuando is a floodplain, comparable with the Barotse floodplain, and linked to the latter by a broad belt of alluvium termed the Mulonga-Matebele Plain, which is subject to flooding in the wet season. The Kafue is a north bank tributary with headwaters on the Southern Equatorial Divide. It initially flows in a general southwesterly direction towards the Upper Zambezi, but the course veers sharply eastwards in the vicinity of a broad floodplain known as the Kafue Flats. This tributary links with the Mana Pools Basin of the Middle Zambezi below the deeply incised Kafue Gorge. The Luangwa River flows in a general south-westerly direction over most of its length – an unusual orientation for a major tributary of an east-draining river. The course veers sharply to the south-south-east a little above the confluence with the Zambezi in the upper reaches of the Chicoa Basin. The mid-Zambezi has a number of relatively minor south bank tributaries, which rise on the central Zimbabwe divide. Their upper reaches flow in a general north-westerly direction. A major tributary of the Lower Zambezi is the Shire, which flows southwards from its headwaters in Lake Malawi, in Malawi. The hydrology of the Zambezi catchment is determined by the annual variation of summer rainfall, which is influenced by the movement of the Intertropical Convergence Zone. The further south the zone moves, the greater the delivery of rainfall across the catchment. In winter these boundaries move north, resulting in drier conditions across the Zambezi Basin. River hydrology is further influenced by man. Off-take for agricultural, industrial and domestic use only amounts to about 3 percent of the total flow of the river. Use by hydro-electric facilities, due to the evaporation lost from the large surface area of reservoirs such as Kariba and Cabora Bass Dams, amounts to just over 5 percent of flow. Usage by these sectors is however likely offset by the increased runoff caused by deforestation, drainage of wetlands and other changes in landuse. (Studies on Lake Malawi (Price et al 1998) indicates that increased runoff caused by the clearing of natural forests in the Shire catchment has meant the level of Lake Malawi in the early 1990s was 1m higher than it would have been otherwise). The annual variation in rainfall between dry winters and wet summers produce high flows in February-April and then progressively lower flows up to a November minimum. The annual flooding is however buffered by the natural flood regulatory capacity of the floodplains developed on the major headwater tributaries. The most important of these are the Barotse and Chobe floodplains in the upper Zambezi, the Kafue Flats on the Kafue River and Elephant March on the Shire River [major tributaries of the Zambezi]. Flow has been further affected by the construction of major dams in the Zambezi (Kariba and Cahora Bassa) and on the Kafue (Itezhi tezhi and Kafue Gorge). The extensive wetland areas along the Zambezi, in particular the Upper Zambezi catchment are important biodiversity hotspots as well as playing a crucial role in regulating floodwaters. 'The densely vegetated floodplains such as the Barotse and Chobe (Upper Zambezi) and the Kafue Flats, with their shallow gradients, form natural sediment traps that greatly reduce the material supplied to the lower reaches of the river system. These floodplains as a consequence form major wetlands that provide important wildlife refuges, particularly for fish, avifauna and water-dependent mammals, including hippopotamus and the lechwe and sitatunga antelopes. Fish migrate into the inundated grasslands of the floodplains during the floods, spawn, and their fry utilize the rich plankton and benthic communities which develop after nutrient release from decomposing organisms drowned by the floodwaters. Readily accessible stretches of the Zambezi and major tributaries, such as the Barotse floodplain, provide a reliable perennial water source, and are thus an important focus for human settlement and agricultural activity (Davies, 1986). As well as Kariba and Cahora Bassa Dams on the Zambezi itself, two other major dams, the Itezhi tezhi and Kafue Gorge Dams have been built on the Kafue, a major tributary of the river. There have been marked changes to the ecology and utilization of the Zambezi River system as a result of the construction of several major dams, such as Kariba Dam and Cabora Bassa on the middle Zambezi, and the Itezhi tezhi and Kafue Gorge Dams on the Kafue. These impoundments had a major impact on the economy of the region. Thus, they represent an important source of hydroelectricity for the whole subcontinent, where there is a rapidly rising demand for power. The introduction of the Lake Tanganyika sardine Limnothrissa miodon (colloquially known as ‘kapenta’) into Lake Kariba in 1967 has formed the basis of an important fishing industry. Against all expectations, this fish survived discharge via the Kariba turbines and sluice gates, as well as a journey of several hundred kilometres to colonise Cahora Bassa, where it now also forms the basis of an important fishing industry (Davies, 1986; Jackson, 2000). The large dams have also become the focus of an important tourist industry. Nevertheless, these economic benefits have come at considerable human and ecological costs. The construction of Lake Kariba led to the displacement of about 50,000 members of the Tonga tribe which had inhabited the area since about 1100 AD, while about 25,000 people were relocated as a result of the construction of Cahora Bassa. These displacements have led to serious community disturbances, major psychological upsets and emotional problems in the attempt to adapt to new terrain and a new way of life, and bitterness and resentment that rankles to this day (Davies, 1986). The dams have also had severe ecological impacts on the major floodplains, as a result of the reduction of the supply of water and sediment. The resultant contraction of these wetlands impacts particularly on fish, avifauna and water-dependent antelope species, and are only marginally offset by the added wetlands of the lake shallows (Davies, 1986). This is well illustrated by the collapse in numbers of the semi-aquatic Kafue lechwe (Kobus kafuensis), which is endemic to the Kafue flats, following construction of the Itezhi-tezhi Dam. Today, this species is confined to a fragment of the former range, with a decline from an estimated population of 350,000 at the turn of the twentieth century to less that 30,000 today (Cotterill, 2005). 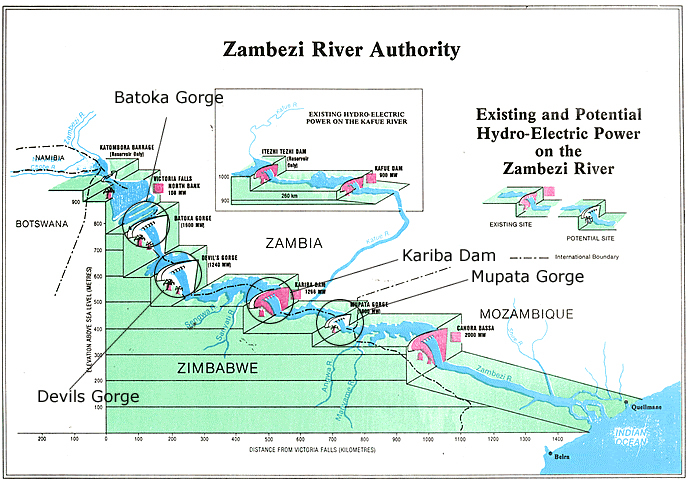 It has also been estimated that the closure of Cahora Bassa led to a 70% reduction of the supply of sediment to the lower reaches of the river, and that this could lead to severe erosion of the Zambezi Delta, threatening both agricultural activity and the important Marromeu wilderness area. During the annual floods prior to construction of the dams, the drowned grasslands of the delta were protected from overgrazing, and thus able to regenerate. The virtual elimination of the natural flooding regime has disturbed this important ecological dynamic. It may also be responsible for the present marked die-off of the coastal mangroves, and the catastrophic decline of the coastal shrimp-fishing industry (Davies, 1986). The latter author notes that a major problem in quantifying the ecological effects of the construction of the major dams was the lack of baseline environmental data prior to their construction. In addition to these exitsting dams, it is also proposed to build hydro-electric dam facilities at the Batoka Gorge and Devil's Gorge, both above Kariba, and the Mupata Gorge, between Kariba and Cahora Bassa. These sites were first identified in 1973, and have been proposed repeatedly over the years. As of early 2013 Zimbabwe and Zambia were in advanced stages of planning for the construction of the Batoka Gorge Dam, which will flood the Zambezi at a maximum level to within 5 metres of the base outflow for the Victoria Falls Hydro-electric station. The dam is due for completion in 2019. The other two damns are looking increasingly likely as the region is predicted to suffer a widening energy deficit. 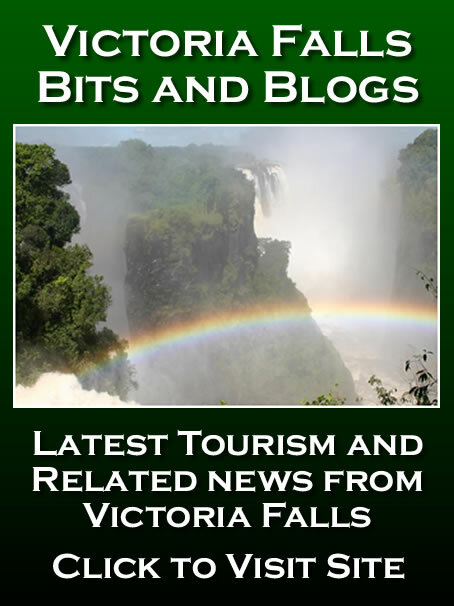 For latest on the proposed Batoka Gorge Dam development please visit Victoria Falls Bits and Blogs Batoka Dam News (external site, opens in a new window). A sixth dam, not shown in the above diagram, is in the advanced stages of planning in Mozambique. Located 60 kilometres downstream of Cahora Bassa Dam has been a hot topic in recent years, being listed as possibly the least environmentally friendly dam in Africa. Management of the Kariba and other hydro-electric facilities requires a network of of thirteen hydrological stations where water levels are monitored daily. Flow measurements are also carried out at eight stations. Along much of the river's length, the population is sparse, but important towns and cities along its course include Katima Mulilo (Namibia), Mongu, Lukulu, Sesheke and Livingstone (Zambia), Victoria Falls and Kariba (Zimbabwe) and Songo and Tete (Mozambique). 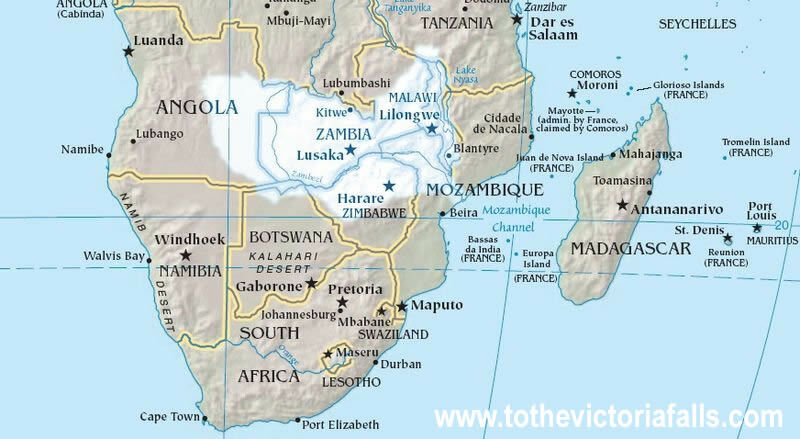 Tete continues to dominate the centre-west part of the region, and is the largest settlement along the length of the Zambezi. The Zambezi is a major geographic boundary and barrier to land based transport. Historically control of the river by the Lozi and TokaLeya boatmen was strategically important to protecting their kingdoms from Matabele (Ndebele) raids, and access to the Barotse heartlands were strictly controlled through strategic crossing points such as Kazungula. Over its entire course, the Zambezi is spanned by only a few bridges: in the upper Zambezi at Chinyingi by a simple suspension bridge and in the Caprivi the Katima Mulilo bridge; in the middle Zambezi the Victoria Falls bridge and two bridges at Chirundu; and in the lower Zambezi sections the Tete suspension bridge and Dona Anna bridge. There are two major ferry crossings, at Kazungula (between Zambia and Botswana) and Caia (in Mozambique). The Cazombo road bridge in Angola was bombed in the civil war and has not yet been reconstructed. The Katima Mulilo Bridge carries the TransCaprivi Highway over the Zambezi River between Katima Mulilo, Namibia and Sesheke, Zambia. It is a road bridge, completed in 2004, 900 metres long and with 19 spans. 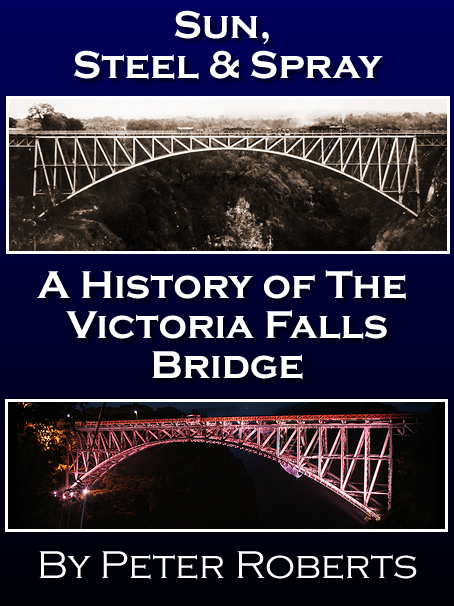 The Victoria Falls Bridge was constructed in 1904/5 as a railway bridge and part of Cecil Rhodes's failed scheme for a trans-continental railway stretching the length of Africa. 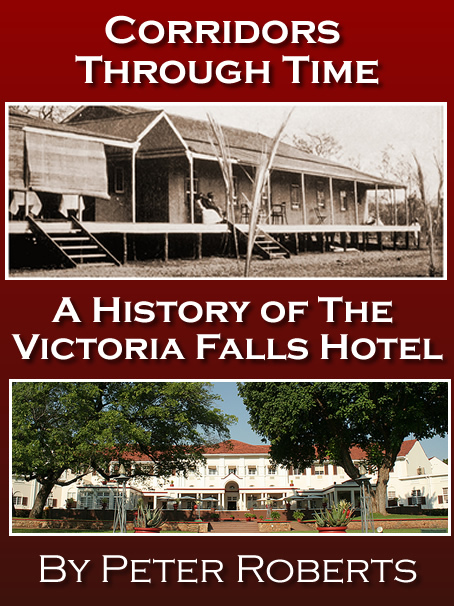 Its location, so close to the Victoria Falls, was not without controversy at the time. At the time of its construction it was claimed to be the highest bridge over water in the world. The bridge was originally designed only to carry railway traffic, supporting two sets of rails, but in 1929/30 the top deck was reconstructed, with only one set of rails, a road and pedestrian footways. Originally known as the Zambesi Bridge, with the construction of later bridges it became known as the Victoria Falls Bridge. The Otto Beit Bridge is a single-lane bridge built in 1938-9 by the Cleveland Bridge Company, the same builders as the Victoria Falls Bridge. The Otto Beit Bridge was the first modern suspension bridge outside the United States built with parallel wire cables. It has a span of 382 m (main span 320 m). As it was built two decades before the Kariba Dam, the engineers had to consider the annual Zambezi flood, now tamed by the dam: hence the requirement for a single span (which the second bridge did not need). The second Chirundu Bridge is a two-lane, three-span continuous pre-stressed concrete box girder bridge, 400 meters long and 10.3 meters wide and was built in 2002. It is 90 metres upstream from the Otto Beit Bridge, using the same approaches and border control area. The one-kilometre-long Tete Suspension Bridge, finished in 1973 by the Portuguese and designed by Edgar Cardoso, is a major transportation facility in the region. The Dona Ana Bridge spans the lower Zambezi River in Mozambique, effectively linking the two halves of the country. It was originally constructed as a railway bridge in 1935 to link Malawi and the Moatize coal fields to the port Beira. 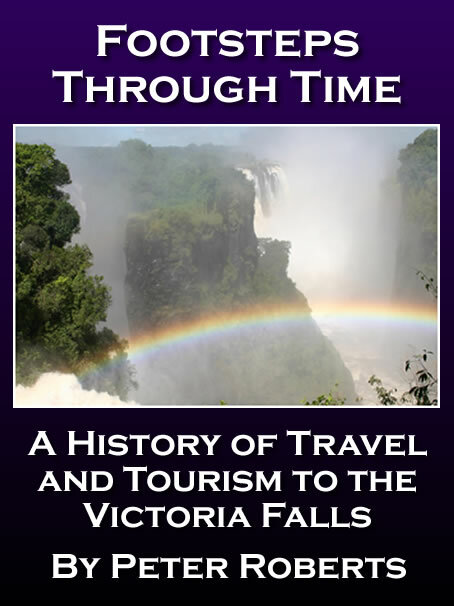 At that time, it was the longest railway bridge in Africa, with a length of about 3 km, and was known as the Zambezi Bridge (the old 'Zambesi Bridge' had by now become known as the Victoria Falls Bridge). In the 1980s, during the Mozambican Civil War, it was rendered unusable. In 1995, it was repaired with funds from USAID and converted to a single-lane bridge for vehicle traffic. The Dona Ana Bridge is the longest bridge to cross the Zambezi and currently the last before its mouth in the Indian Ocean. In 2007 construction started on the longest road bridge to span the Zambezi to replace the ferry at Caia, and which will become the last bridge before the mouth of the river. With a planned length of 2376 m and width of 16 m it will be exceeded only by the Dona Ana Bridge, which it is planned will be restored as a railway bridge. Above the Falls, the Kazungula Ferry is a pontoon ferry across the 400-metre-wide section of the Zambezi River between Botswana and Zambia. It is one of the largest ferries in south-central Africa, having a capacity of 70 tonnes. The service is provided by two motorised pontoons and operates between border posts at Kazungula, Zambia and Kasane, Botswana. It links the Livingstone-Sesheke road (which connects to the Transcaprivi Highway at Katima Mulilo) to the main north-south highway of Botswana and also to the Kasane-Victoria Falls road through Zimbabwe. Plans for a bridge to replace the ferry crossing are in development, with construction planned to begin towards the end of 2012. Coppinger M & Williams J (1991) Zambezi - River of Africa. Struik, Cape Town. 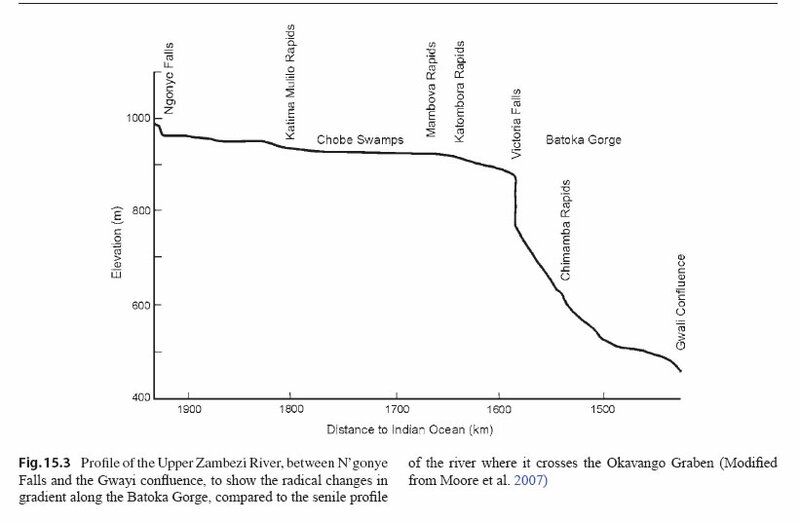 Gupta, A (2007) [editor] Large Rivers: Geomorphology and Management John Wiley and Sons, England. MacDonald J R (1955) Zambesi River. MacMillan & Co Ltd, London. 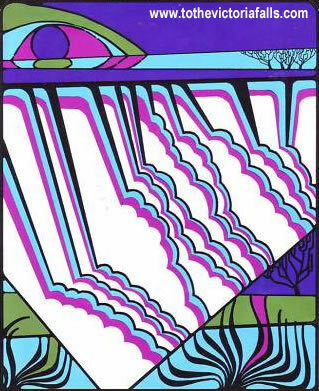 Main, Michael (1990) Zambezi – Journey of a River, Southern Book Publishers.